The starting point of the Phenotypes / Limited Forms project is the archive of photographer Armin Linke, which contains over 6000 images. We were seeking a new form to present such a large archive in an exhibition space. We wanted to go beyond a static display and, instead, give people the opportunity to build their own interpretation and then leave a trace of this interpretation. What we did is produce about a 1000 of Armin’s photos on high-quality photographic prints and put the prints on three long shelves, 12 meters long. Visitors of the exhibition can just flip through the photos and simply enjoy Armin’s rich archive. It’s a bit like flipping through stacks of vinyl records in a record store. As people move images around, the wall itself becomes an evolving display of the archive. People can pick out the prints they like and carry a selection of photos with them. This selection can then be used to print a small book. We designed an editing table for this purpose. It is positioned in the middle of the exhibition space. Visitors lay out 8 of their images on the editing table. The table uses RFID technology to detect the images that are laid out on top. When the visitors are happy with their selection they print out a paper copy using a thermal ticket printer. Before printing, people must enter a title for their book using a virtual keyboard on a touch screen in the table. As soon as someone finishes a book, we’re projecting the title of the book on the a wall in the exhibition space. We also show the titles of the books that were made by other people but that are related to the new book. The idea is to make people aware that creating a book is not an isolated event but adds a new point of view to the archive. Besides the physical installation, we created a web site that functions very similarly but is accessible on-line. You can navigate through Armin Linke’s archive and when you find photos that you like, you take them along with you by dragging-and-dropping them in a clipboard. As soon as you have a selection of images, you can start creating a book using the book editor. Simply drag-and-drop the photos from the clipboard onto the virtual pages of the book. 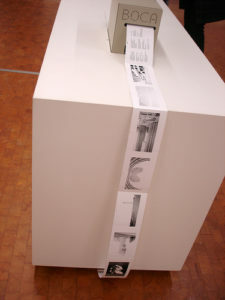 For 100 euros, it is possible to obtain a paper copy of it that is printed by Graphistudio in Venice using the same high-quality printing technique that is used for the prints in the installation. More than 40,000 people have used the installation to create a book. All the books that have been created in the installation are available on-line. – Museum of Contemporary Art, Siegen, Germany. 05/2009 – 09/2009. – Graphic design: Alex Rich. – Curatorial design: State Academy of Design Karlsruhe, Wilfried Kühn, Professor for exhibition design and curatorial practice (State Academy of Design Karlsruhe), Doreen Mende, lecturer for curatorial practice, Nina Beitzen, lecturer for exhibition design, Samuel Korn, tutor for Phenotypes/Limited Forms. – Students: Elena Bozhikova, Katharina Domokosch, Wolfram Glatz, Samuel Korn, Kristina Moser, Steffen Oestreich, Sophie Remig, Felix Vogel, Sarah Waldschmitt, Alice Wilke. – 1000 photographs, 1000 RFID tags, 8 pieces of RFID reading equipment, 1 touchscreen, 1 PCs, 1 BOCA micro ticket printers, 50.000 thermo-paper tickets, video projector or LCD TV screen, Internet connection. – Physical space of minimum 12 by 4 meter. Three shelves of 12 meter long. – Software for editing table: Java Runtime Environment. – Server: LAMP (Linux, Apache, MySQL, PHP), the Ikoru software, PDF Toolkit, ImageMagick.